A chair is a piece of furniture designed for a person to sit on. It usually has a horizontal surface, the seat, which supports the human buttocks from underneath. The seat, which is often padded for more comfort, is itself supported by 'legs', typically four of them, that have a height approximately equal to the lower leg, so that the person's feet will comfortably reach the ground when seated. The person's back is supported by another part of the chair which is also called the 'back', or 'backrest'. 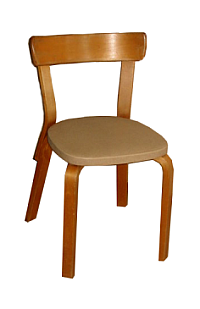 A chair that has no back is called a stool. An optional part of a chair are armrests that support the seated person's forearms. The chair as the place of chastisement (vintage drawing). In spanking art, chairs are particularly significant because it is common for a spanker to sit on a chair (typically an upright-back unpadded armless chair) to take a spankee over their lap for an OTK spanking. It is also common for a spankee to bend over and grasp the seat of a chair for a strapping, paddling, cropping, or caning. Less common, but still fairly common, is for the spankee to bend over the back of a chair. In both cases the buttocks of the spankee are elevated and presented for the spanking. Bent over a chair, standing, tied to the chair's legs. Illustration by Martin van Maële from the novel Camille et Moi. "Peinliche Situation" ("Embarrassing situation"), anonymous vintage German spanking drawing. 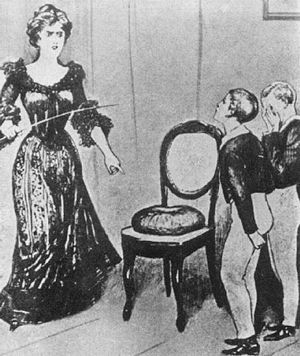 Spankee kneeling in a chair, illustration by G. Topfer. Spankee laid over a chair. Spankee bent over the back of a chair. Spankee bent over with hands on a chair, drawing by Spankart (2007). Boy/girl spanking over two chairs back-to-back. Another, more exotic, way in which chairs can be used as an item of spanking furniture involves two chairs which are placed back to back. The spankee then kneels on the seat of one chair (preferrably the chair is padded or a cushion is put on the seat to kneel on) and bends over the two backs, placing their hands (or elbows) on the other chair's seat so that his buttocks are raised to an exposed position, convenient for spanking. This is, in a way, a variant of the on-all-fours position with the help of two chairs that prevent the spankee from moving out of position. Among spankophiles, chairs are the most popular items of spanking furniture (next to beds and couches) because of their domestic spanking connotations and availability in every home. A chair or stool gives better support for the classic OTK spanking position than a couch or armchair which is usually lower and in which the spanker will sink in too much. Armrests make a chair unsuitable for most spanking positions, so spankophiles generally prefer chairs without armrests. Spankee sitting in a chair to receive a lecture. Medieval era Chair of Torture. It is also common for a spankee to be made to sit in a chair, often on a bare bottom, after a spanking, as further punishment. Often this is a variation on corner time. Someone may also be directed to sit in an isolated chair as a time-out before or instead of a spanking. When a chair is used in the 'pre-spanking' time-out way, it will have a very strong impact in the mind of the spankee because being told to sit on the chair means that he is in serious trouble. The spanking video Naughty Chair (reissued by NaughtyBottom.com and CanedSchoolGirls.com) uses this practice for a school punishment scenario. There is often one special place where a punishment session always happens. It is that chair used for this. It is the favorite chair used by the spanker to enhance their authority figure. Being told to sit in the chair means things such as: Think on what you did and later we will talk. The chair can also be the place in which the spankee will listen to the unavoidable lecture. While still seated in the chair, the spankee can try arguing to avoid the spanking. The command "Get on your feet" means that the arguments and dialogue didn't work. Getting up, in this situation, means to give the chair over to the spanker who will then sit down themself and put the spankee over their lap for an OTK spanking. 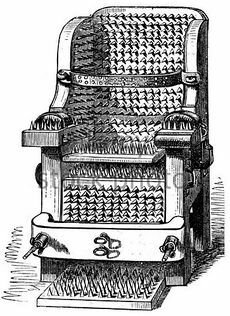 Perhaps the most painful chair ever created was the notorious Chair of Torture or witch's chair used in the Middle Ages by the Inquisition to extract confessions from accused witches. These spike-covered chairs were used in Italy and Spain until the end of the 1700s and in Germany up to the late 19th century. Chained Nudes for the Devil's Seat in Hell - lurid magazine fiction from Man's Story (October 1962) featuring the Witch's Chair. This page was last edited on 5 July 2018, at 19:41.